March 14th, 2011: Snoods Banned! Please see the information below that relates to the wearing of Snoods at all Levels of Football. The International Football Association Board held their Annual meeting on Saturday 5th March. At that meeting it was decided that Snoods (Neck Scarves) that some players wear could constitute a danger to themselves if an opponent pulled them, and were not part of the Basic Equipment as outlined under Law 4 – Players Equipment. This Pitchcare site has really good advice for looking after your pitch throughout the season. If you are suffering from constant postponements this could really help you. Don't rely on the owner of the pitch to put in the work to keep your pitch playable. Owners, particularly if they are Local Authorities, are cutting back on services. They are due to lose 6 pitches in Exeter due to cuts. Don't let that happen here, be proactive. In the continuing League manner of transparency, all of the information from each league and cup match teamsheet has now been entered. This means that you can now view how many times a player has played for a particular team in a particular division. To do this you click on the team in the relevant division. This will bring up the team's latest fixtures and results but you will see a tab that says "Player Season Totals". Click on that and you will then see a list of players. The number of times they have played is the number of appearances in the first column added to the number in the bench column. The bench column signifies that a player was a used sub. Being an unused sub does not qualify as an appearance. Teamsheets are taken at face value as a club is signing them to say they are correct but it is pretty evident that very often the substitutes section has not been completed correctly. Even if the ref forgets to complete this section it is still your duty to complete it, otherwise you are signing an incorrect teamsheet. All teamsheets will be entered from now on. Some clubs enter their own player stats and that will continue. If clubs are considering a protest under the playing strengthened teams rule they should first refer to this and use the information to detail the protest. 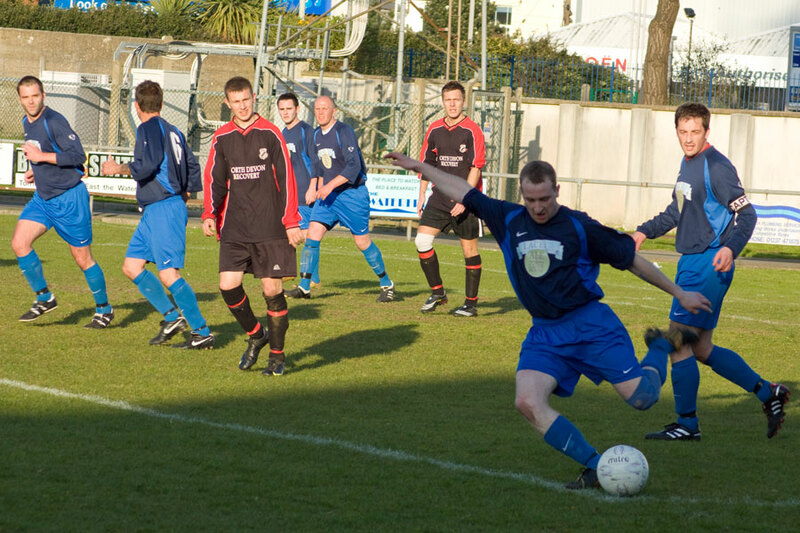 Teamsheets are normally inputted by the Registrations Secretary at any time during the following five working days after a game depending on when they are received. Protests regarding strengthened teams would then have to be in four working days after, ie for a Saturday game it would be by the Thursday of the week after (12 days in total after the game). Please can clubs remind themselves of the rule on postponing matches due to the weather. The rule is: In bad weather conditions which make ground or travelling conditions impractible, the Management Committee shall accept the agreed decision of both clubs to postpone the fixture, or the opinion of a qualified refereee (which may be requested by either club) that the condition of the ground on match day is not suitable for the match to be played. No club shall inform its own selected players that a match has been postponed for such reasons until agreement on the postponement has been reached with the opposing club. If the clubs fail to agree and are unable to obtain the prior opinion of a qualified referee such decision shall be taken by the match referee on arrival, except where the owners of the ground forbid its use, such decision shall be binding on all concerned. Written confirmation of the owner's decision may be requested by the League. When the Management Committee is satisfied that there has been abuse of this rule, a fine of £40 shall be imposed on the offending club. This is a rule from the old handbook that is applicable and has been allocated reference ND 10.6 in the League Rules. Please also note that if the match is postponed you must still phone through notification to the Agency or you will be fined. 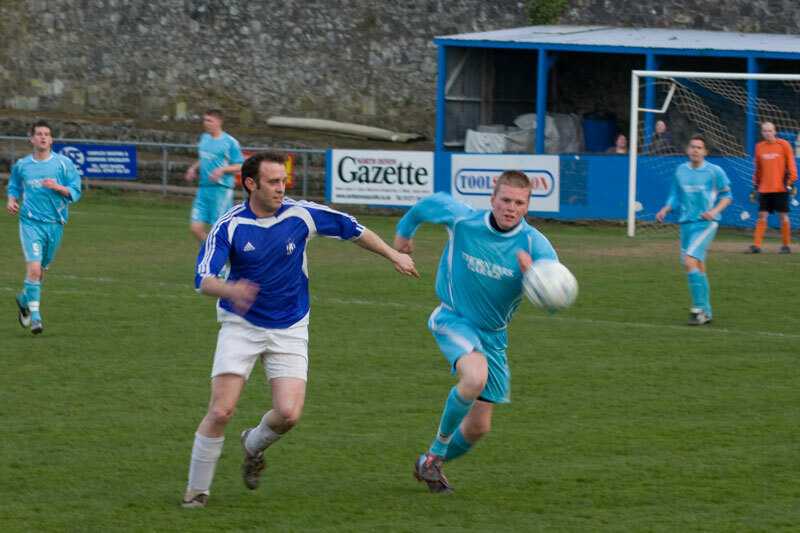 The North Devon Football League is pleased to announce that the new sponsors are the North Devon Gazette. We are very grateful for their support and look forward to the future. The Annual General Meeting of the North Devon League has taken place. The new President is Bill Smale who many of you will already know has been a faithful and true servant to North Devon Football for many years. The winners of the Harold Bartlett Trophy (Highest marked Ref) and Club Administrator of the Year were Peter Sercombe and Phil Prouse of Northam Lions respectively. Congratulations to you both and especially to Phil Prouse who is the first person to win the Club Administrator Trophy twice. Apologies for the delay in getting this photo on the site, (technical issues with the camera!) 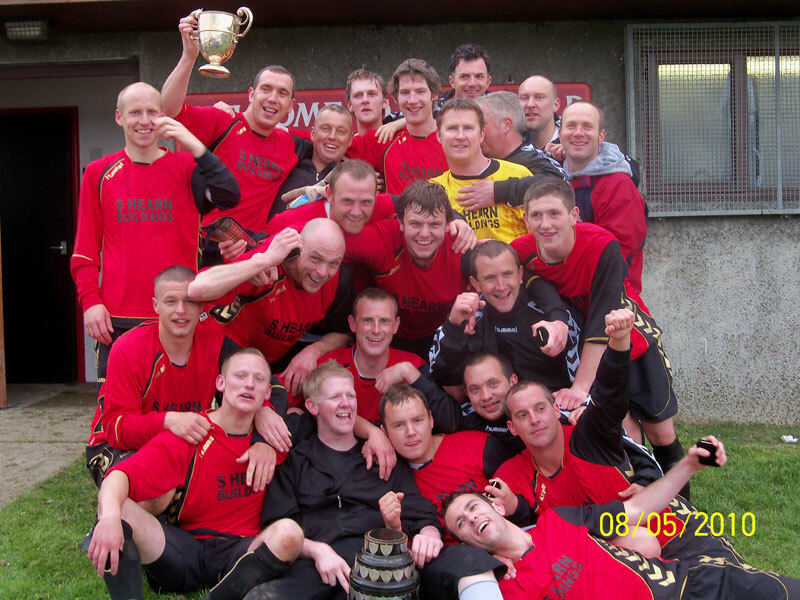 Congratulations to Woolsery FC who have completed the League and Cup double this season. They were presented with the Intermediate One Trophy by Alan Evans, the League Chairman and Mick Tattersall, the League Secretary. 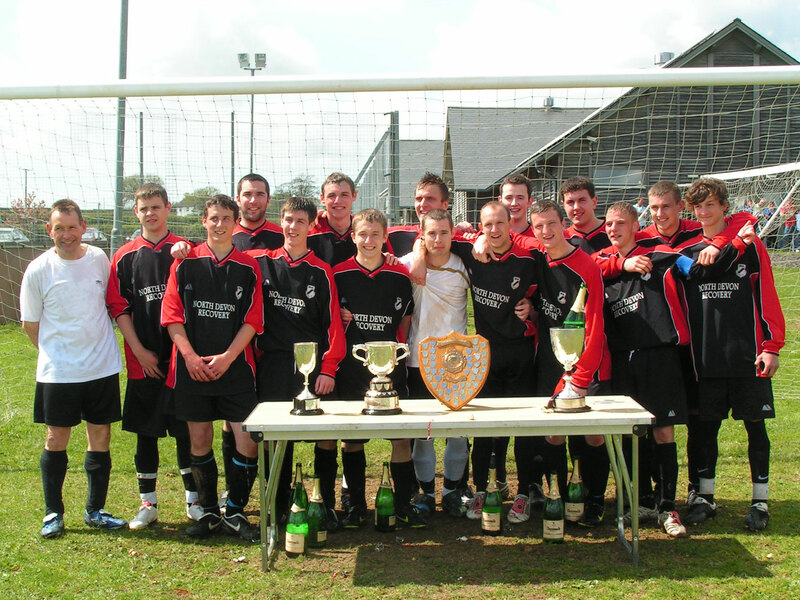 Congratulations to Braunton Reserves who have completed the League and Cup double this season. 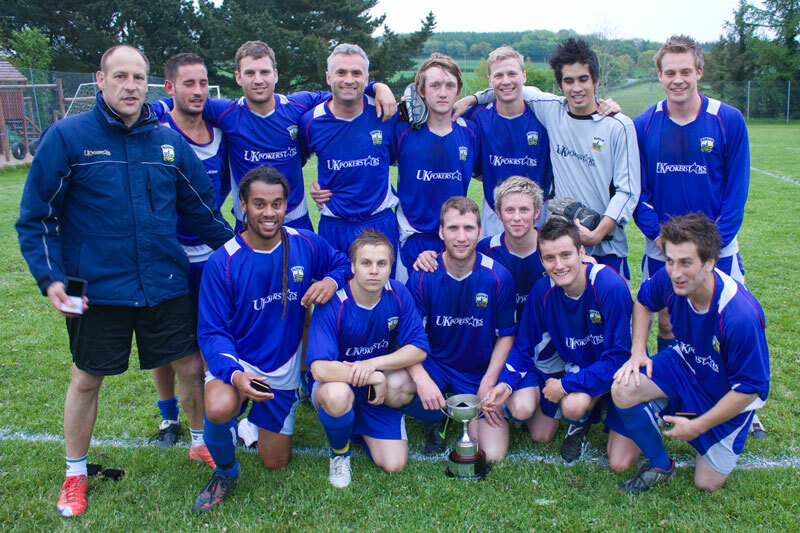 They were presented with the Senior Trophy after their match against Chittlehampton. For those of you that attended any of our cup finals you will have seen the programs that were produced. Printers HJ Badcock very kindly sponsored these programs and printed them for the league free off charge. The League Secretary has since spoken to HJ Badcock and agreed with them to offer all our member clubs a 20% discount on orders over �50.00. They can offer a wide variation of printing and if you look at the attached PDF 2.39MB, you will see they also print things like Raffle Tickets, Flyers, Posters etc. HJ Badcock are a family run printing company in Mill Road, Barnstaple and have be going since 1945 and is currently run by the founder's grandchildren. 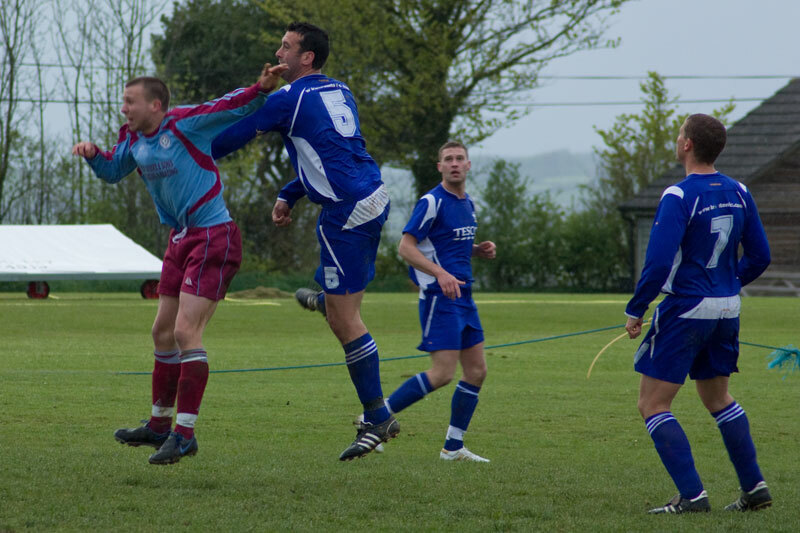 The North Devon Football League is extremely happy with the work carried out by HJ Badcock and found them to be very professional and can not fault their service. On the attached PDF is a discount code �NDJFL� please remember to quote this when asking for any prices otherwise you will not received your discount. 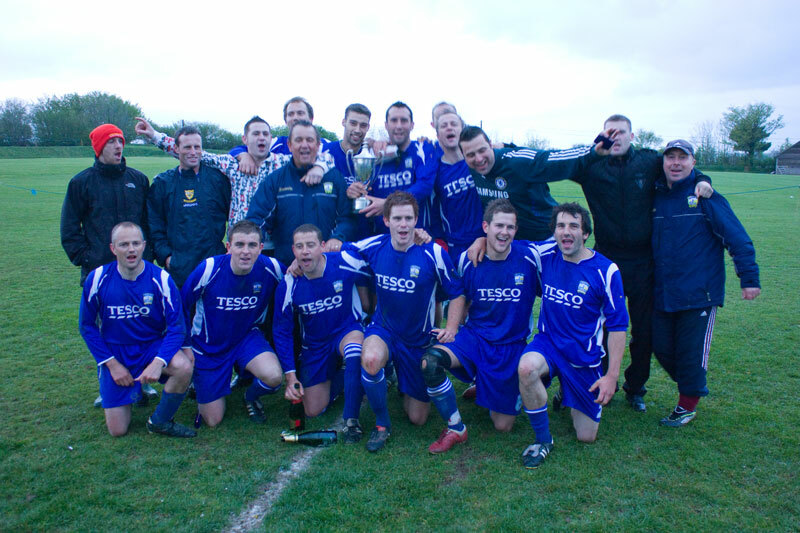 Boca Seniors four year reign as the North Devon Football League Champions has ended right at the wire with Shamwickshire Rovers winning their last game of the season to take their first title since Season 2003-03. Congratulations to all at the club. North Devon Journal League Secretary, Mick Tattersall, and Vice-Chairman, Dave Parish, presented the Premier Trophy after the game. 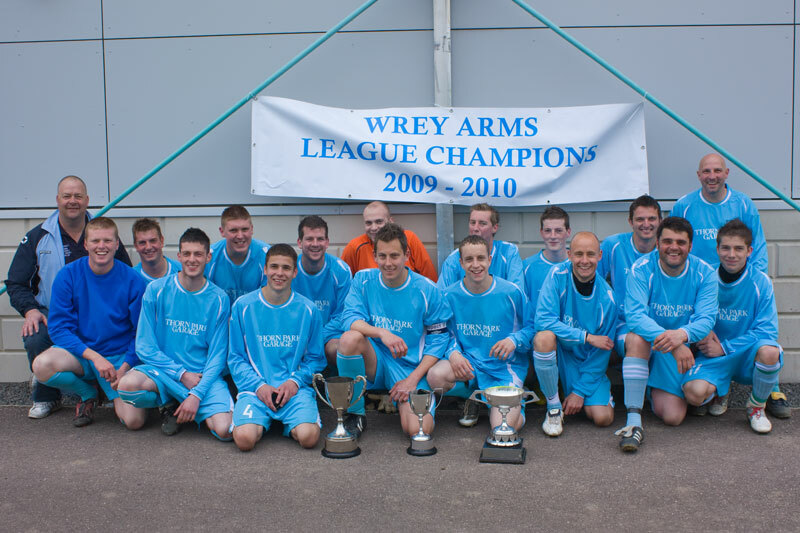 Congratulations to Wrey Arms who have completed the League and Cup double this season. 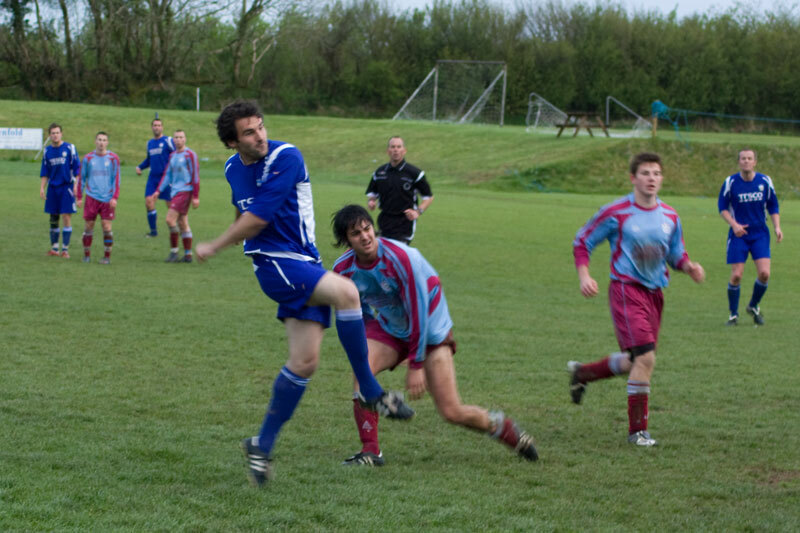 They are still currently undefeated in the North Devon Football League. 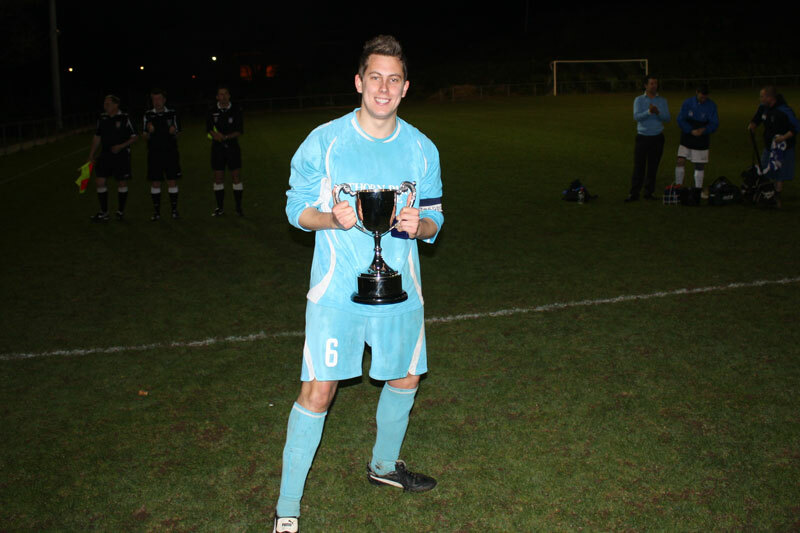 Braunton retained the Brayford Cup with a crucial spell of finishing early in the second half. 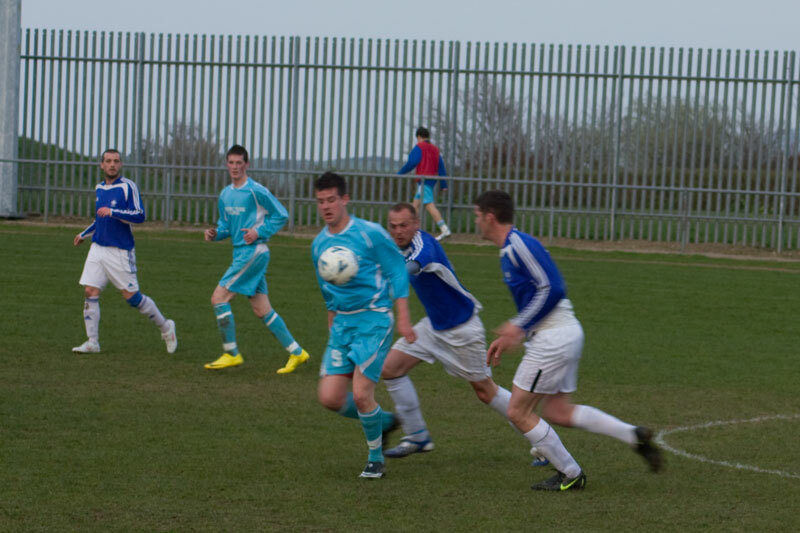 Torridgeside will be ruing their missed chances in the first half but the young side battled away right to the end. Read the match report . 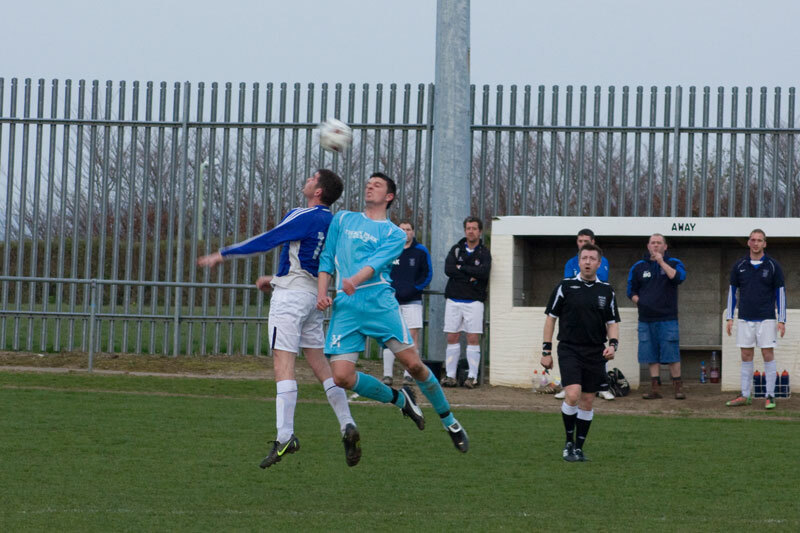 Man of the match was Russell Harrison of Braunton. 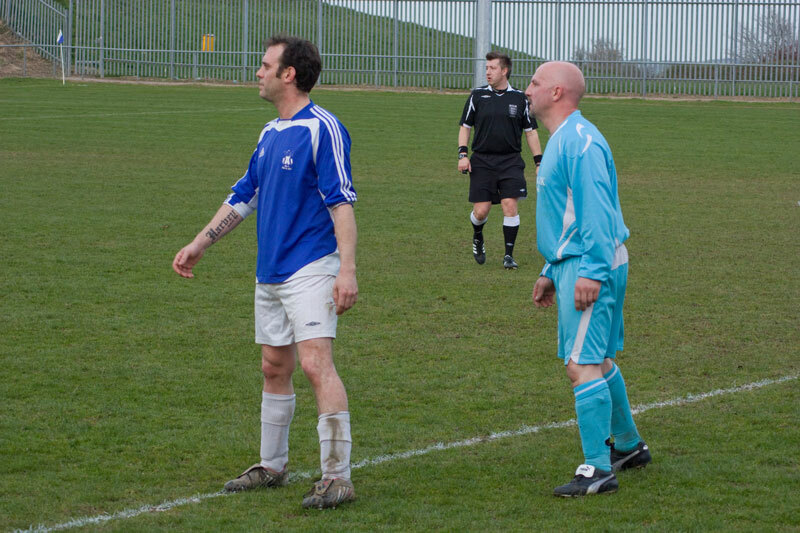 The match officials were: Referee: Alan Webster, Assistant Referees: Andy Woolf and Gary Paine. 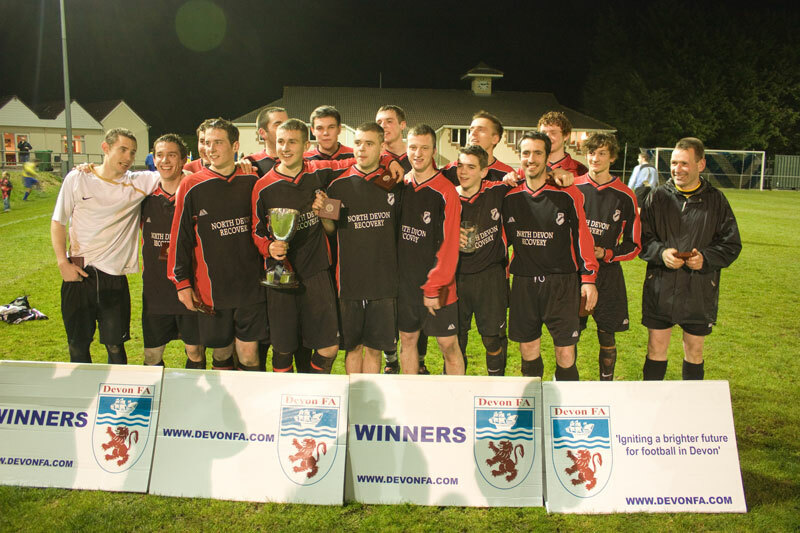 Thank you to North Molton FC for hosting the final. Braunton: John Vaughan, Callum Norman (Anthony Casinelli 58), Jake Barwick, Dave Bennett, Scott Maynard, Kevin Prust, Darren Roach, Jason Jones, Mark Sanders (Richard Goodyear 79), Adam Cornish (Elliot Whitecross 54), Russell Harrison. Sub not used: Paul Parkin. Torridgeside: Lee Cockwill, Paul Boundy, Ian Cockwill (Scott Huxtable 41), Craig Allan, Patrick Ions, Martin Boundy, James Mayne, Corey Hynd (Mark Sussex 17), Tom Hampton (James Tillier 73), Nathan Walter, Kyle Paine. Subs not used: Richie Bright, Dean Andrews. 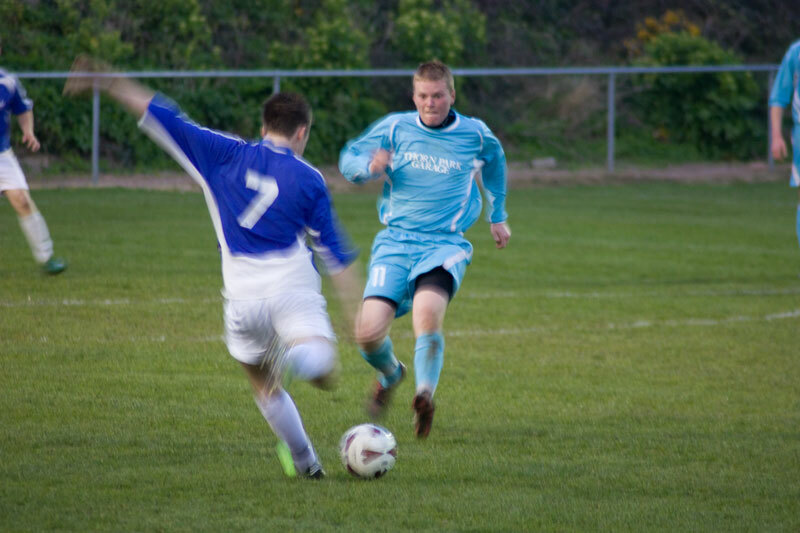 Braunton Reserves made it third time lucky as they overcame Chittlehampton at Hollands Park. 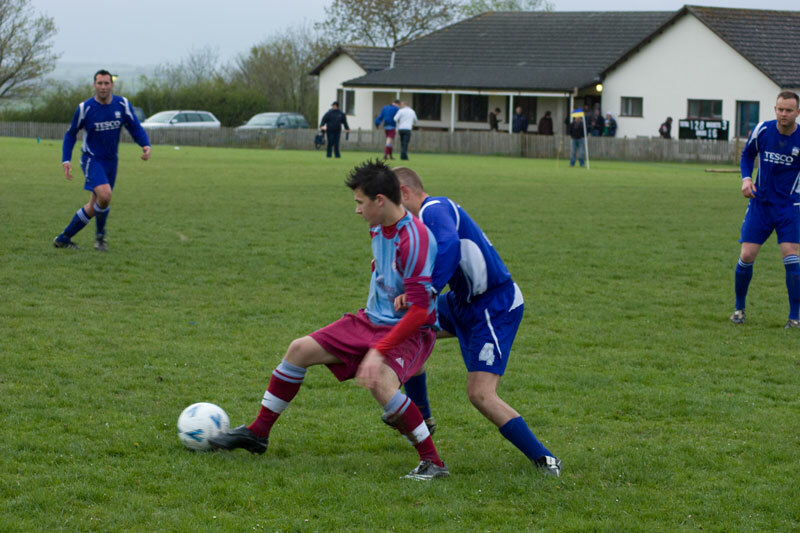 Man of the match was Jordan Darch of Braunton Reserves. The match officials were: Referee: Scott Hill, Assistant Referees: Fred Saunders and Frank Biederman. Thank you to Combe Martin FC for hosting the final. Woolsery are still on for a triple this season but were made to work right until the last minute of this enthralling tie. 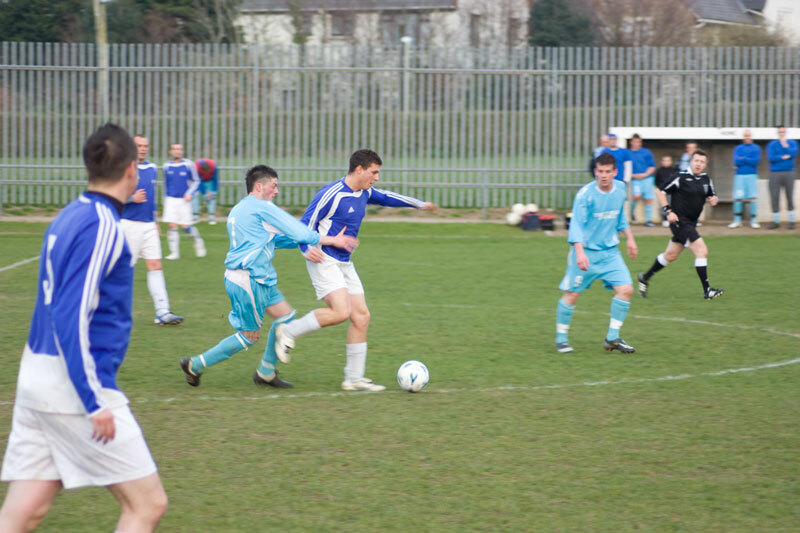 Both teams were very competitive and the result could have gone either way. With the match all square at the final whistle the game looked to be heading to penalties when Woolsery fired home to take the honours. Man of the match was Ben Hayne of Park United. The match officials were: Referee: Peter Sercombe, Assistant Referees: Adam Sowden and Ian Hart. 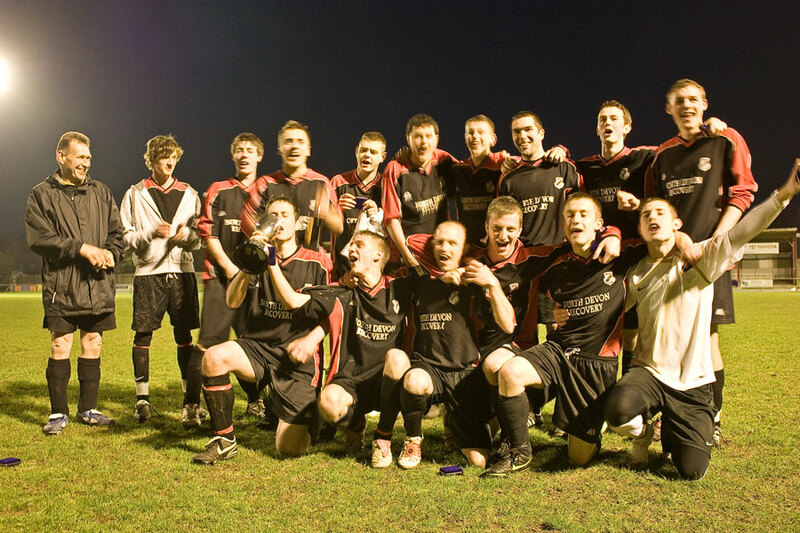 Thank you to Bideford FC for hosting the final. Park United: Peter Yarde, Shawn Joy, Mark Pooley, Colin Harris, Mark Newmand, James Lee, Gary Phipps, Kevin Buck, Stephen Flood, Ashley Hocking, Ben Hayne, Subs: Simon Reid, Bob Ashton, Adrian Barker, Karl Clements. Woolsery: Josh Hawkes, Jamie Robinson, Tom Summers, Ashley Glover, Tom Hawkes, Matt Lamont, Nick Glover, Paul Mills, Mischa Howe, Luis Wilkins, Russell Costigan, Subs: Nick Symons, Matt Lewis, Sam Bissett, Xien Witt, Kevin Glover. 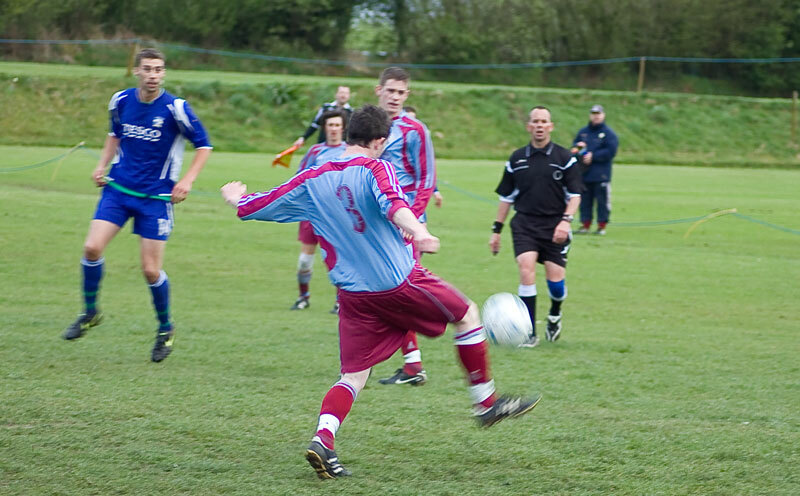 Wrey Arms stayed on course for a League and Cup double as they overcame a spirited Pilton side 3-1 at Marlborough Park. 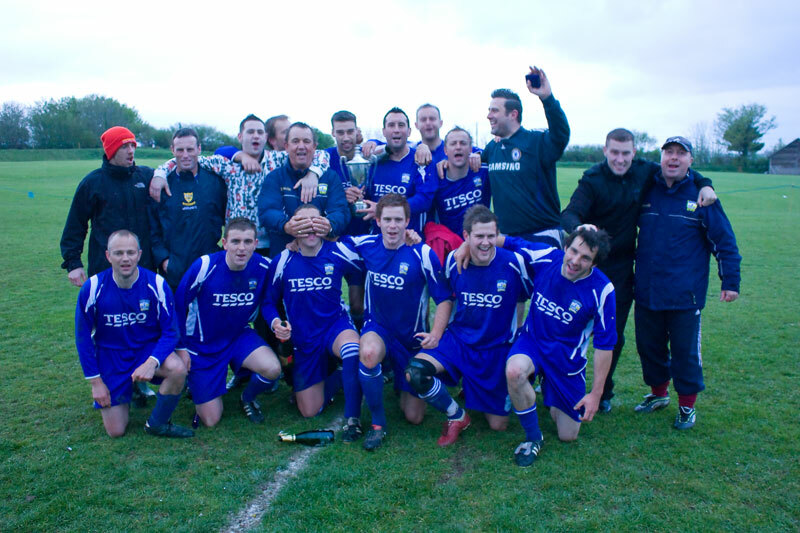 Goals from Jimmy Hill, Dan Larcombe and Simon Larcombe saw them win their first trophy back in the North Devon Journal League. Simon Larcombe was the Man of the Match. 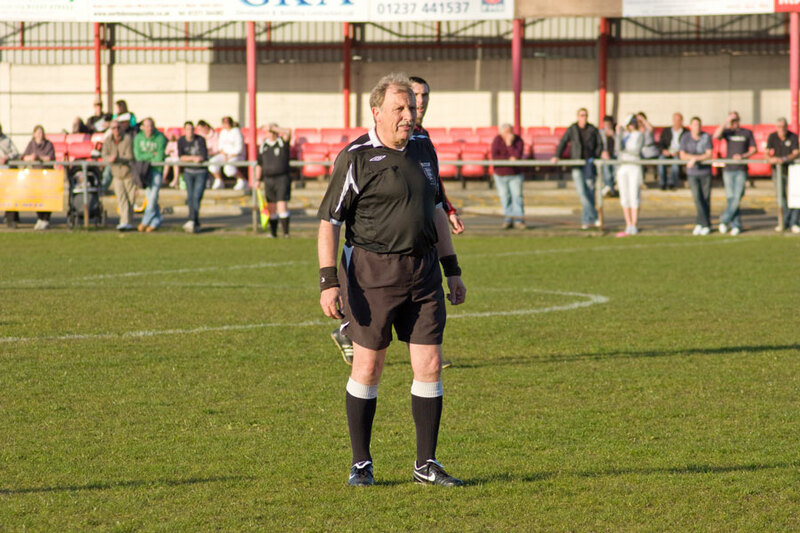 The match officials were: Referee: Wayne Harrison, Assistant Referees: Gary Suggate and Peter Sercombe. Thank you to Ilfracombe Town FC for their hosting the final. Read the match report . Pilton Academical Reserves: Dave Holton, Simon Furse, Kevin Ten-Bokkel, Martyn Mules (Capt), Andy Keeble, Alex Boreham, David Coggin, Rob Tancock, Baz Yates, Lee Ellis, Sam Hommell, Subs: Gary Ellis, James Doble, Richard Stanbury, Dave Perryman, Matthew Dellar. Wrey Arms: Sam Tabbener, Lee Capner, Russell Shaddick, Mike Knott, Marc Churchill (Capt), Dan Larcombe, James Hill, Simon Larcombe, Dan Dayman, Steve Folland, Lee Holding, Subs: Steve Ayre, Kirk Lace, Craig Smith, Kevin Weir, Gareth Drayton. Congratulations to Woolsery who beat Windsor Car Sales 4-2 at Coach Road, Newton Abbot on Thursday night to become the Intermediate Champions of Devon. It was a cracking game and Woolsery thoroughly deserved the win. North Devon Journal League Assistant and Registrations Secretary and Devon FA Member was honoured and proud to be the guest at the match and be able to present the trophy and man of the match award to Marc Clark. 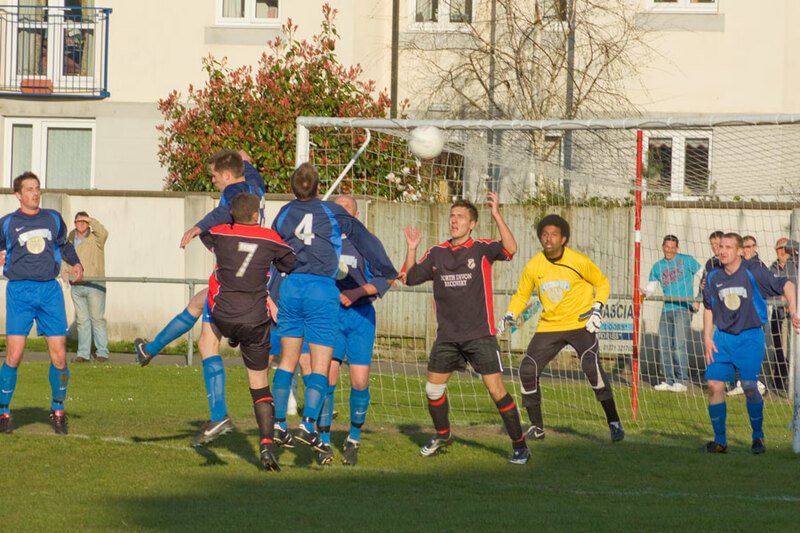 Read the match report on the North Devon Journal website . The pre-match reports are also well worth reading, read them here and here . 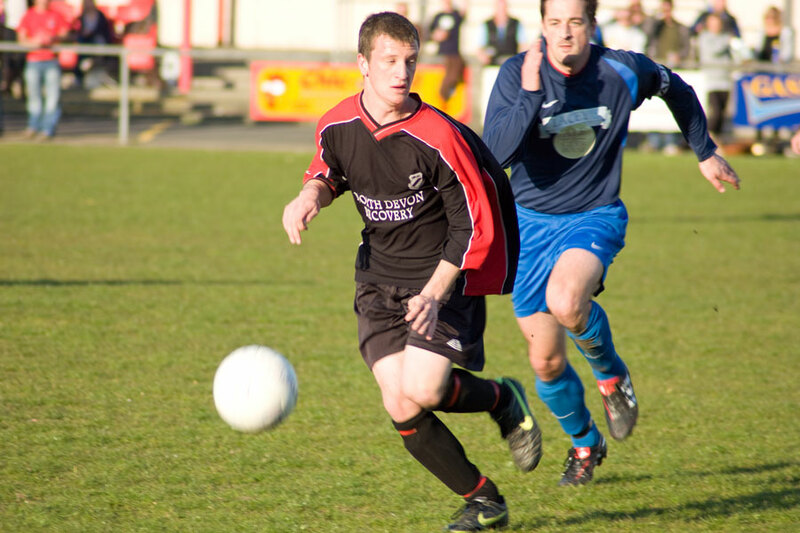 There is also a report on the Devon County FA's site which is written by Jim Pearcy who is a Devon FA Life Member. 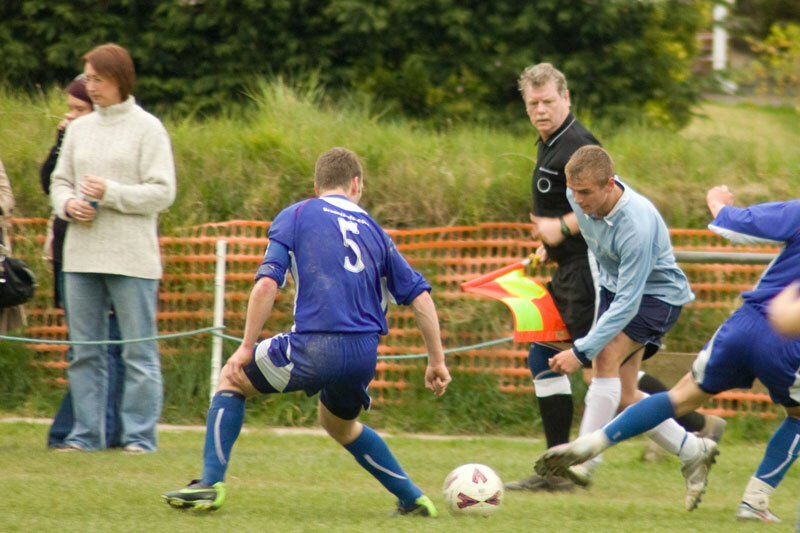 Photos of the day can be seen and purchased on the County FA's photographer's website . 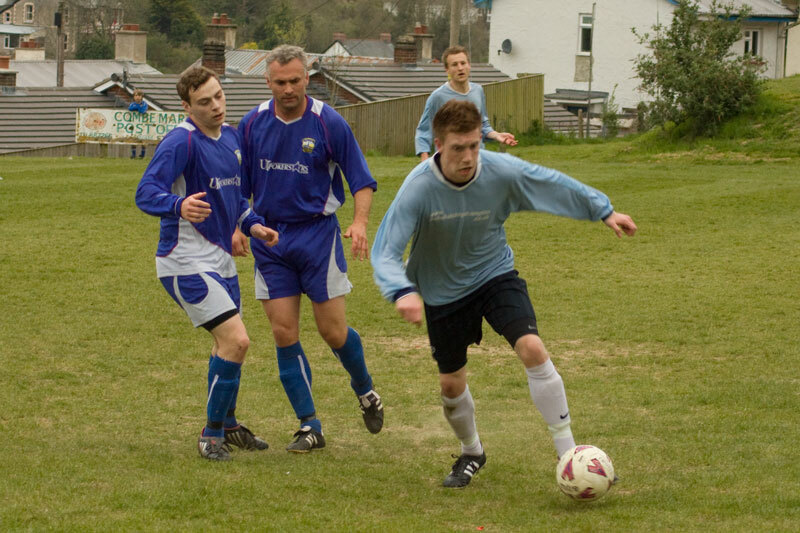 Congratulations to the Hodgson Insurance Kingsley League who pipped North Devon League representatives Landkey Town at the post in a 4-3 thoroughly entertaining match. On the night �214 was raised for the Cancer Fund at the NDDH including a very generous donation from Landkey Town of �83. 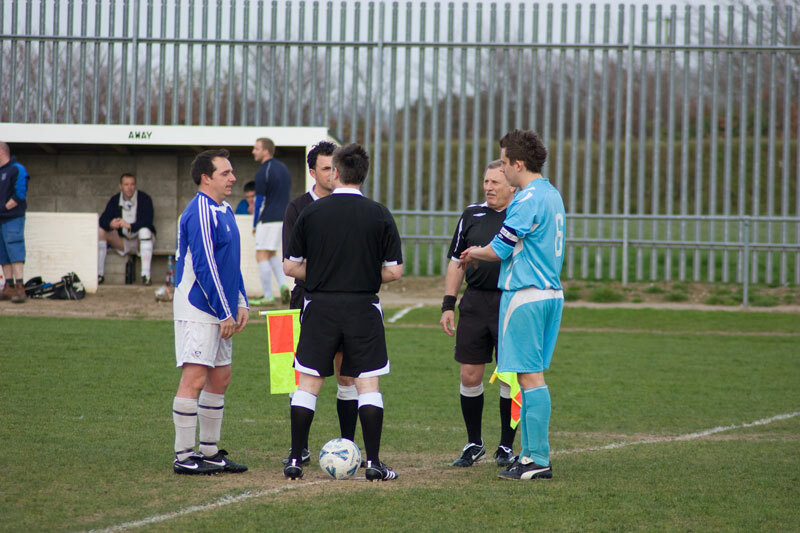 Thanks also to the match officials, Andy Woolf, Michael Clark and Chris O'Brien, who very kindly waived their match fees. Read the match report . Albert Beer, the North Devon Journal League President and Devon FA President sadly passed away this morning (Saturday 16th January). Albert began his lifelong connection with football well before the Second World War. 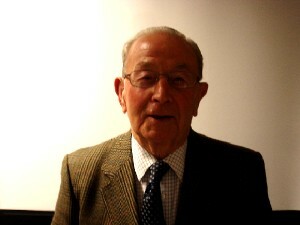 He was first voted on to the Devon FA in 1962. 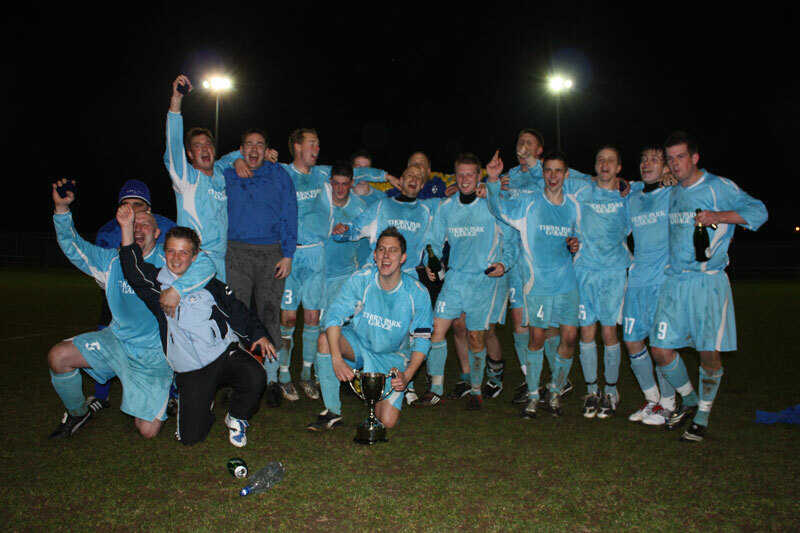 He became Devon FA President in 2005 and it was apt that one of his last public engagements was to present the 2009 Devon Premier Cup to Boca Seniors, the first team from the North Devon Football League to win it. The thoughts of the League are with his family and friends. The tribute that was in the North Devon Journal can be read here. 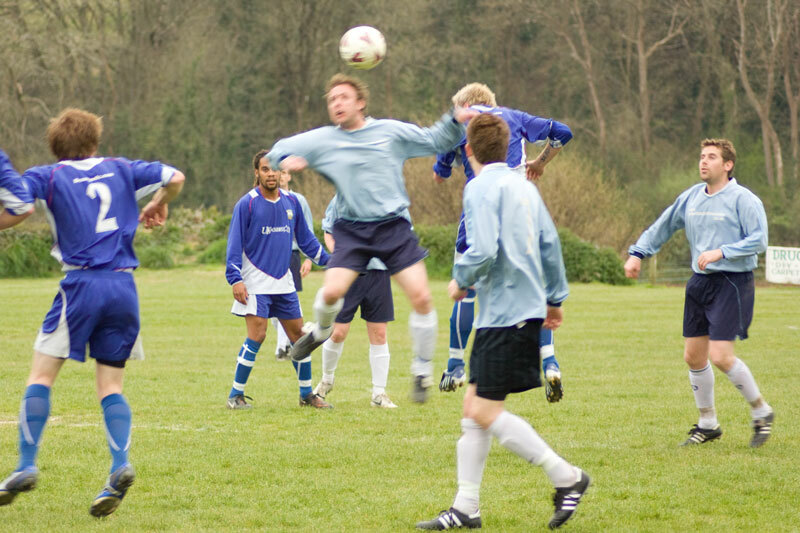 The Devon FA have decided that they will contact each league for a copy of their player registration database. 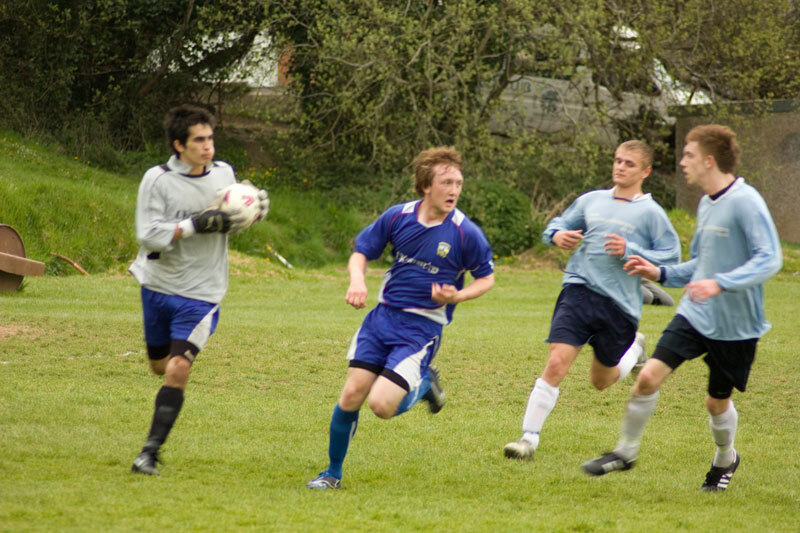 This will be amalgamated with the databases from all the other leagues in Devon to form one player registration database. At this time player photos are not required. Club Secretaries should hang on to the paperwork they have already received as it is anticpated that photos will be required in the future but this is unlikely to happen this season. A number of clubs have been reporting that they have had difficulty in locating the teamsheet after the game. Home clubs are reminded that the onus is on them to locate somebody from the away side to complete the teamsheet after the game. On the Governance page some frequently asked questions have been added which may save you a lot of work and phone calls. Club Secretaries can now print off a Secretary's Guide to running their club and league procedures and spare team sheets via the Secretary Login page. All referees have been instructed by The FA to strictly apply the Laws of the Game in relation to the wearing of jewellery and in particular wedding rings. Up until this season, at local level, it has been acceptable practice for a single band wedding ring, which cannot be removed, to be taped up. This is no longer permitted and that, from the start of the forthcoming season, ALL jewellery, including wedding rings, MUST be removed. This does also apply to referees (except for a watch or similar device for timing the match). 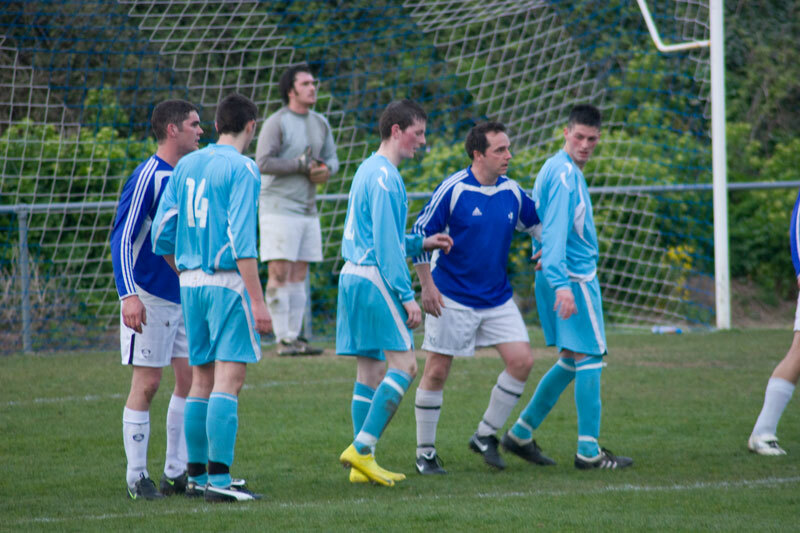 Club's are reminded that it was resolved in March 2008 that as from the start of season 2009-2010, all clubs in all divisions would be required to have separate changing and washing facilities for match officials at their grounds. 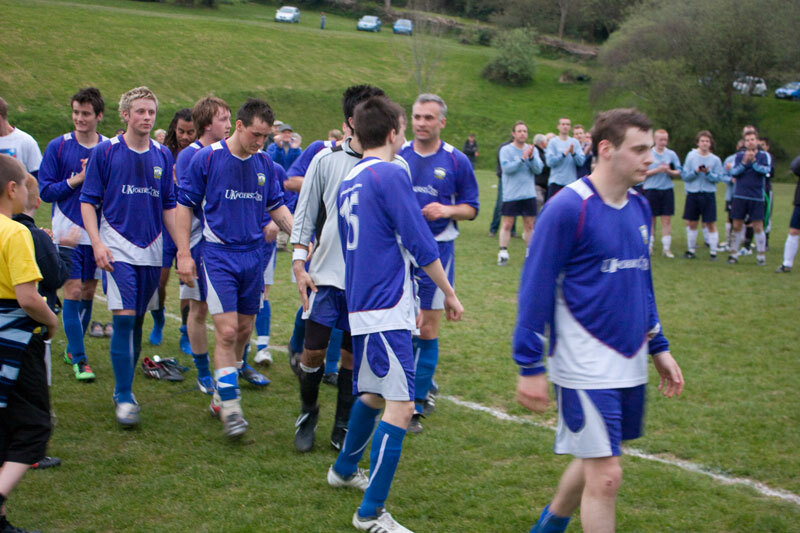 The Devon FA can assist your club to recover monies due to your club. However there are strict criteria, mainly involving time limits. View the rules here. The AGM took place on Tuesday 30th June. 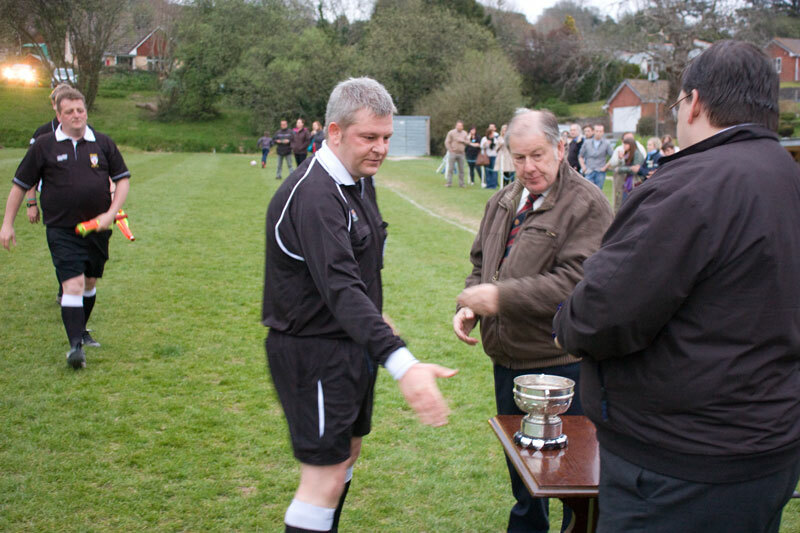 Referee Fred Saunders was presented with the Harold Bartlett Trophy for the highest average mark over the season for a record fourth time. After a sensational season on the pitch Boca Senior's Secretary Dave Loder was presented with the Club Secretary of the Year Trophy for the work he does off the pitch. A special plaque was presented by the Chairman of the North Devon Journal League, Alan Evans, to Brian Fishleigh, Chairman of Boca, in recognition of the club's achievements this season. The alterations to the Standard Code of Rules referred to at Item 7 are viewable online (pdf 426KB opens in new window). Hartland are the latest club to setup a website providing information on the club. Check it out here. At the League AGM last night, Fred Saunders was awarded the highest marked referee's Trophy and Rob Bates picked up the Secretary of the Year Trophy. Every year at the AGM the Devon F.A recognises those people who have put so much into local football with the long service award. The award acknowledges the efforts that have been made by the recipients over a period of many years. 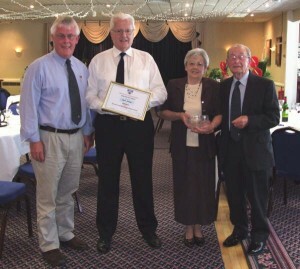 The awards were presented by Devon F.A president Albert Beer along with North area members John Fry and Jimmy Jewell. The photos show Alan Johns of Clovelly FC and Tony Alcock of Ilfracombe FC receiving their awards. 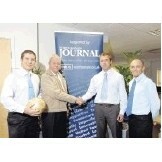 The Journal is proud to be announced as the new sponsor of the North Devon Football League. 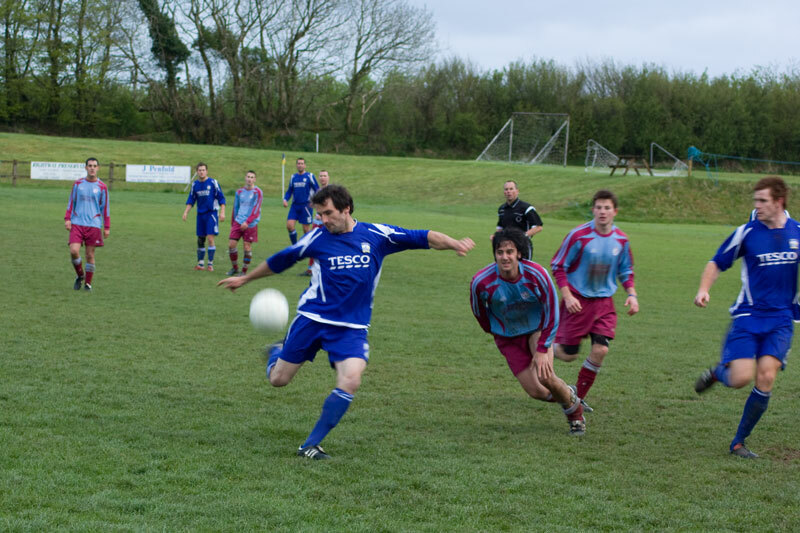 For more than 100 years, all the football action from the pitches and playing fields of North Devon has been covered by the area's premier paper. 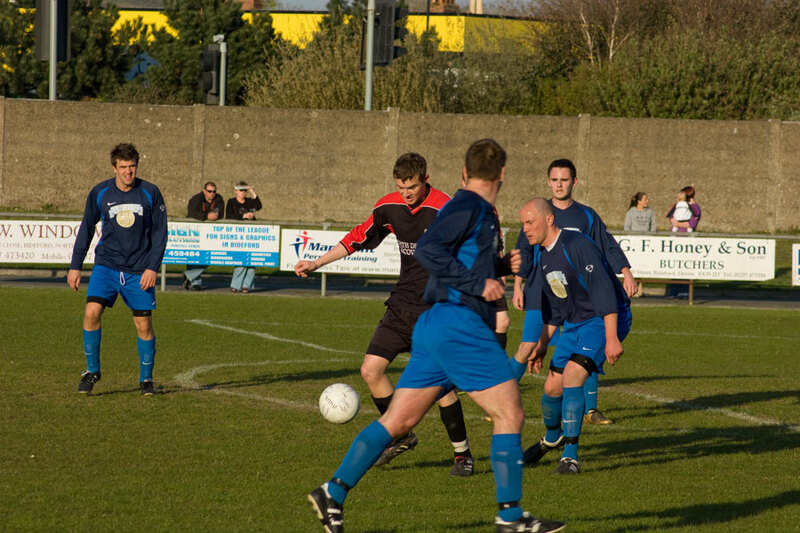 And after forging a relationship which dates back to coverage of the first ever league game in 1904, the Journal was chosen by league officials to succeed long-time sponsors Bideford Tool. 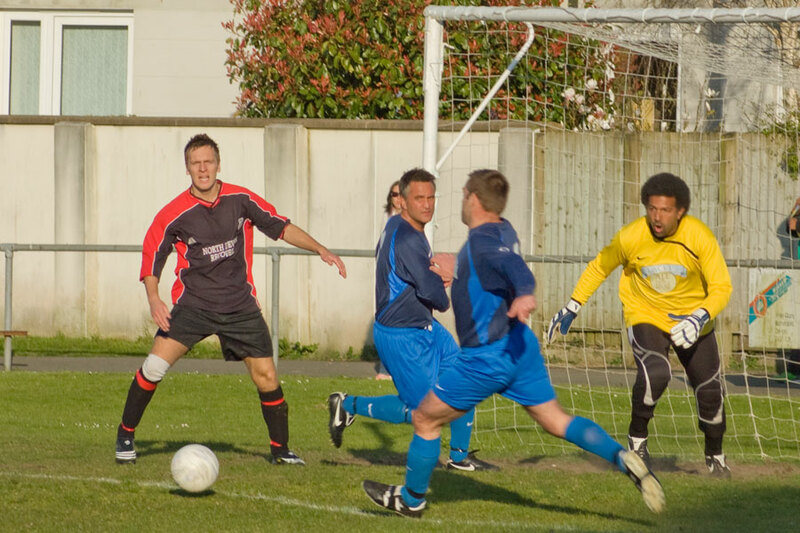 Journal advertising manager Dale Sawyer was quick to recognise the opportunity, and clinched the deal ahead of two other competitive offers at Friday night's NDL committee meeting. 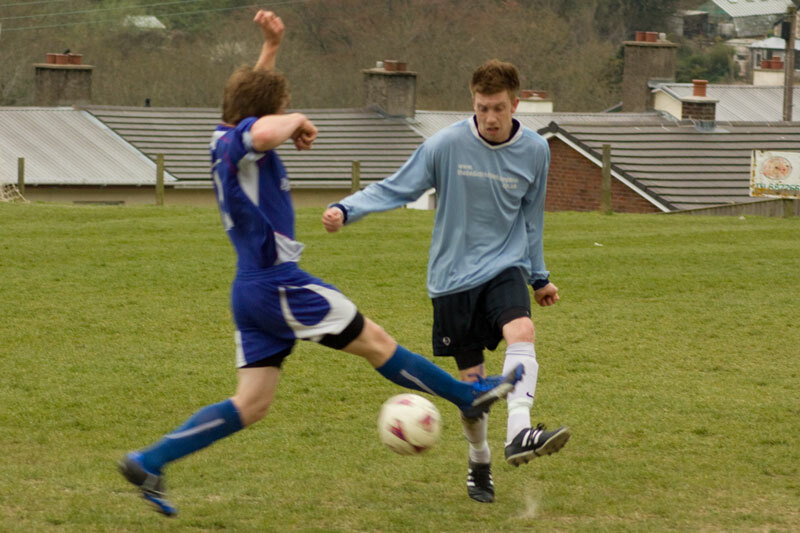 Sports editor Chris Rogers said: "The chance to become the North Devon League's main sponsor was too good an opportunity to turn down. "For many years the league reports have formed an important part of the Journal's sports section, and the relationship between the league and the paper has been excellent - thanks in no small part to the dedication and hard work of my predecessor Dave Pedler. "This new sponsorship deal takes our relationship to another level, and we are determined to do it justice." League treasurer Peter Woodhams added: "I would like to thank the North Devon Journal for sponsoring us and I hope it will be a long and lasting partnership. "It was only three years ago that the league celebrated its centenary, and it is now entering an exciting new era." Sporting Barum have been awarded the FA Charter Standard Award. This award recognises that the club is well run with qualified staff and that the club has set standards in discipline, organisation and best practice. 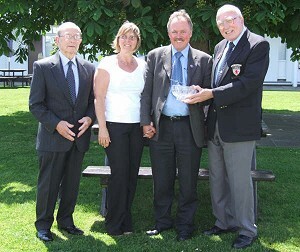 At present there are only a few other clubs in North Devon who have attained the award. Sporting's secretary Rob Bates said after receiving the award "I think that as with a lot of things people think there is so much work involved that they haven't the time to put in the effort to obtain these awards. I'd like to assure any other club who is thinking of applying for the award you will probably find you are already doing many of the things required so it is a natural progression to have some recognition for the work you have put into your club." Anyone thinking of applying who would like more information on that award can contact the club via their contact page.